Presentation of a report on ‘Membership Benefits, Engagement and Development at IMCA’ by Andrew Cronin Finn a student in the 2012 / 13 MSc in Management Consultancy Programme at UCD’s Smurfit Business School at IMCA’s office in Ballsbridge on August 28th. The report is based on a project completed as part of Andrew’s MSc programme. 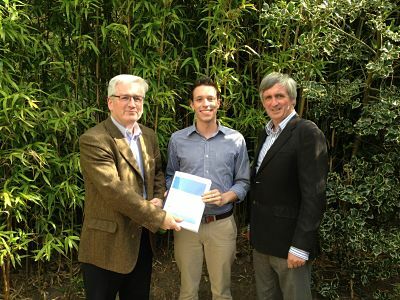 Pictured (L to R) Tony Roe, Treasurer IMCA; Andrew Cronin Finn and Tom Moriarty, Development Director, IMCA. The report covers a) development of ‘Consultant Resource Kit’ a one-stop database of guidelines, checklists and sample documents relating to working as a consultant in Ireland b) a Marketing Plan to help communicate the value of the ‘Consultant Resource Kit’ and member benefits generally and c) strategic recommendations in the areas of benefits, engagement and membership development. The report and recommendations will be uploaded following their review at the October IMCA Board meeting.